Railpictures.ca - Jason Noe Photo: There are limited places in Southern Ontario where mainlines parallel busy roadways for several miles, however Highway 7 between Acton and Guelph is not one of them. The Guelph Subdivision runs beside the highway for many kilometers and has some interesting views. However, currently with only a limited amount of CN daylight freight movements in this section, GO and VIA Rail trains are now the main players. Photographed leaning out the window of a moving car, Goderich-Exeter Railway (GEXR) 3054 is seen overtaking traffic on Highway 7 as it leads 431 into Guelph on a warm summer afternoon. | Railpictures.ca – Canadian Railway Photography – photographie ferroviaire Canadienne. Caption: There are limited places in Southern Ontario where mainlines parallel busy roadways for several miles, however Highway 7 between Acton and Guelph is not one of them. The Guelph Subdivision runs beside the highway for many kilometers and has some interesting views. However, currently with only a limited amount of CN daylight freight movements in this section, GO and VIA Rail trains are now the main players. 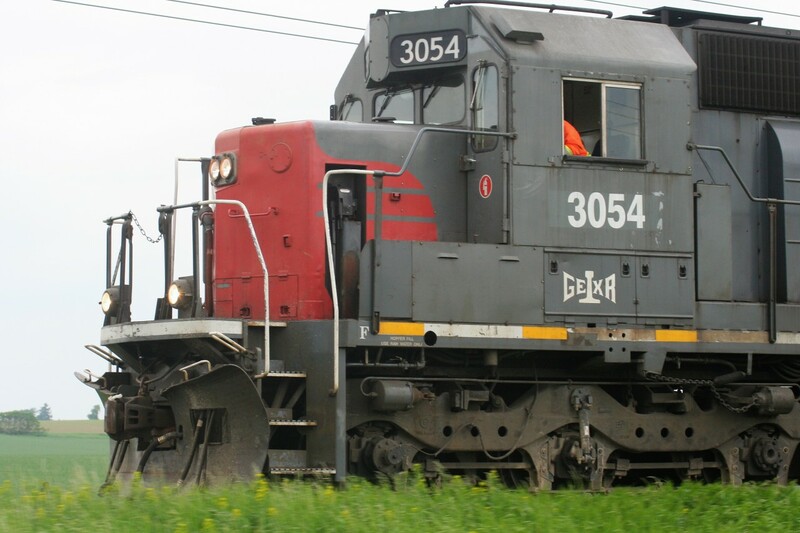 Photographed leaning out the window of a moving car, Goderich-Exeter Railway (GEXR) 3054 is seen overtaking traffic on Highway 7 as it leads 431 into Guelph on a warm summer afternoon.